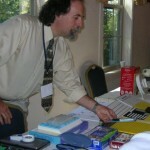 Low Vision Technology is an assistive technology resource created and updated by Steve Kelley, a Vision Rehabilitation Therapist in Portland Maine. Steve earned a MA in both Vision Rehabilitation and Rehabilitation Counseling from the University of Arkansas, Little Rock. A Vision Rehabilitation Therapist is a professional who works with clients experiencing vision loss or blindness from diseases such as Macular Degeneration, Glaucoma, Diabetic Retinopathy, or other causes of low vision. Be sure to check out Low Vision Tech on Twitter or Low Vision Tech on Facebook.